Last master class of the year today so a big thank you to everyone who attended over the last month, it was and has been enormous fun. One of the things we discuss is my formula for creating a fabulous pad and whilst I won’t give to much away a top tip for creating the perfect laid back lair is layering. Art is the easiest thing to layer particularly if you take it off the wall and prop on shelves, tables or against the wall. 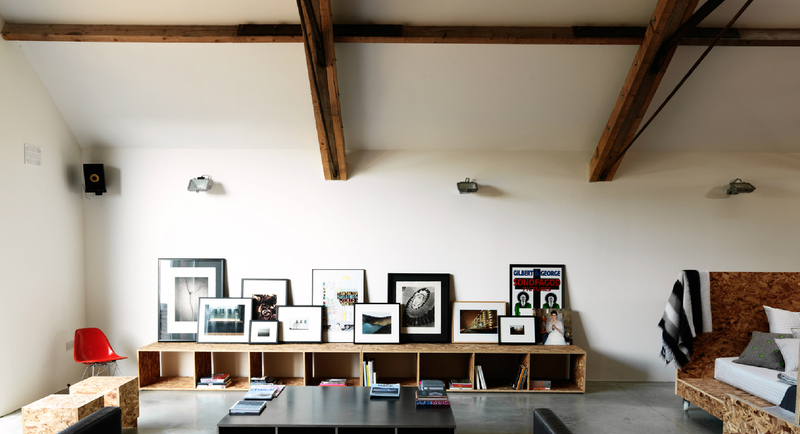 Propping not hanging art will make your space feel instantly laid back. Also the more art you cluster like this the greater the impact, as you can see below in this lovely image shot by Damian Russell. Homes in my mind shouldn’t feel precious where you have to take your shoes off the moment you walk through the door or put coasters down on tables every time you want a coffee. Perfection isn’t a good thing when it comes to decorating – -a space co-ordinated or decorated to an inch of its life feels SO static, actually I will go as far as saying self important. You kind of want to mess it up a little which is why layering is so important. Books on coffee tables, t-lights everyone, flowers all over the place, accessories on mantles, shelves, tables. The more informal the arrangement the more informal the vibe. So forget symmetry and everything matching mix it up a little a house without layers feels untouched by human life and who wants to live in a house like that I ask myself? One of the coolest laid back lairs around the home of Kate and Andy Spade photographed by Todd Selby. Cosy, warm, laid back could move in right now!